From the Newsletter: Zoning – Location Change! 1. Our Location Has Changed!!! The September 8, 7:00 pm zoning meeting will be held at Saint Maron’s Church at 1013 Ellsworth Street. 2. Some recent attendees have asked for more info about upcoming projects. We think that’s a great suggestions, and please bookmark and keep an eye on passyunksquare.org/zoning – our goal is to upload plans and refusals, post agendas, and share results on our revamped zoning page shortly. 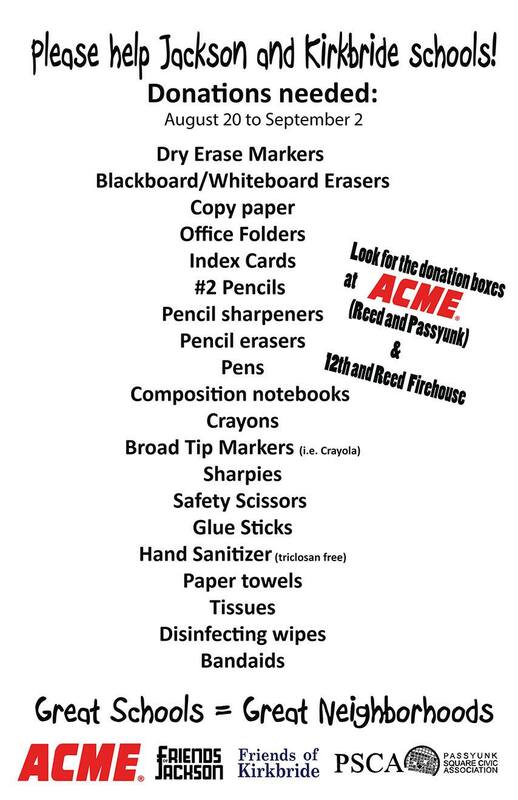 Friends of Jackson and Friends of Kirkbride Elementary need help collecting school supplies for our local students! Can you help by donating any of the items on the list below? Drop-off boxes are at the ACME Markets store at 10th & Reed and at the firehouse at 12th & Reed, from today until September 2. Thank you for your support! 1202 Ellsworth (3rd floor addition to existing single family) – Unanimous vote in non opposition from committee and community. 1535 S. 10th (take out food request) – Unanimous opposition from committee and community. 1108-10 Federal – will need to return in September to resolve a boundary/ownership issue with the lot in question. Email zoning@passyunk.org with any questions regarding the Zoning Committee or visit passyunksquare.org/zoning.